From left: Jason Anick, Olli Soikkeli, Vinny Raniolo, and Greg Loughman comprise the Rhythm Future Quartet. Django Reinhardt is one of the most influential guitarists in jazz, but the “Gypsy jazz” he invented with violinist Stephane Grappelli in the Quintet of the Hot Club of France can seem as dated, and codified, as Baroque opera. 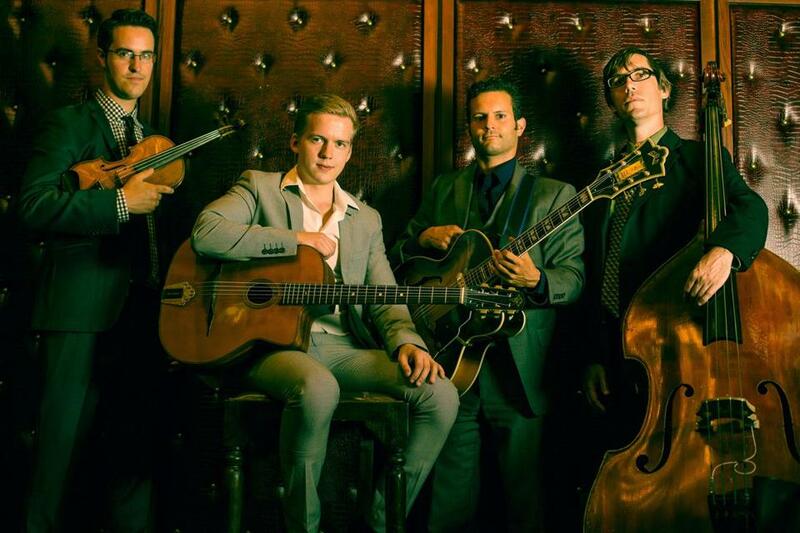 The Hot Club embedded Django’s guitar in a specific context: acoustic guitars, bass, and violin, furious “Gypsy” lead-guitar chromatic ornamentations, and ceaseless four-to-the-bar “pomp” swing rhythms. Unlike other revivalist swing outfits, who can work variations on old repertoire and sound fresh, Gypsy jazz would seem a dead end. Yet, more than 50 years after Django’s death, the Hot Club sound lives on. There are numerous Django fests and Django camps, and any number of Reinhardt-inspired bands, from New England’s Ameranouche to New Orleans’s Harmonouche. “It’s a niche style,” allows Jason Anick, the 29-year-old violinist and co-leader of the latest entry in the crowded field, Boston’s Rhythm Future Quartet, which plays the Arsenal Center for the Arts on Nov. 17 and Arts at the Armory in Somerville on Nov. 22. An instructor at Berklee, Anick has broad interests. In two albums under his own name, he covers Horace Silver, the Beatles, and Ornette Coleman, and writes challenging originals. So . . . why Django? “It’s the energy, the acoustic sound, the virtuosity, the excitement,” Anick says before the quartet’s recent CD-release show at Passim. But, just as important, he sees the Hot Club setup as still ripe with possibilities. For one, the “chamber jazz” format (all acoustic, no drums) allows for intricate arrangements and innovation. The band takes its name from one of Reinhardt’s most avant-garde forays, “Rhythm Futur,” an unclassifiable rave-up that breaks standard song form with odd rhythmic shifts and harmonies. That guitar would be Olli Soikkeli, 23, who is with us at Passim. As someone who picked up guitar as a 12-year-old in a small eastern Finnish town, did Soikkeli play Scandinavian black metal, then switch to Django? “That’s exactly what happened,” Soikkeli answers. “Well, not black black metal, but Metallica and all the great rock players.” Recognizing his talents, his mother found him a worldly guitar teacher who introduced him to Django. Soikelli was soon in his teacher’s band, eating up the playing of latter-day Django-ologists like Stochelo Rosenberg. Soikkeli made biannual visits to the states and met Anick at the annual “Django in June” camp in Northampton, where both were teaching. And then there’s the playing. Anick supplements his sweeping, unpredictable lines and high-velocity outbursts with a sweet tone and rich vibrato. When he plays the Reinhardt/Grappelli ballad “Tears,” his vocal phrasing shows a depth of feeling that transcends slick showmanship. Soikkeli shreds with purpose. His articulation at high speeds — flurries of 8th and 16th notes — is stunning, and beautiful. And though he can’t resist double-timing a slow-tempo piece like “La Gitane,” you sense the steely control behind the youthfully impetuous virtuosity. At the Passim show, Rhythm Future offers more of Anick’s tweaks on the formula. They play his winding composition “Sleepless,” a modern jazz steeplechase that fits the Gypsy jazz setup to a T. In a duo feature, Soikkeli and guitarist Ivan Peña (filling in for quartet member Vinny Raniolo), play a Russian folk song — in the Gypsy style. And Anick spins off more than one classically-influenced cadenza. Meanwhile, Peña drives the “pomp” rhythm that Anick calls the piston of the band while Loughman provides leavening with his pliant beat. Those who missed John Zorn’s “Masada Marathon” at Newport this summer get a second chance to hear from him on Tuesday, when New England Conservatory presents “The Music of John Zorn: A 35-Year Retrospective” at Jordan Hall. A 7 p.m. Q&A between Zorn and frequent collaborator and NEC faculty member Anthony Coleman precedes the 8 p.m. concert. . . . Another Zorn associate, saxophonist Uri Gurvich, plays Berklee’s Café 939 Wednesday. . . . The always politically sharp Aardvark Jazz Orchestra continues its season with a free election-week special at MIT’s Killian Hall Saturday . . . . Jazz Composers Alliance Orchestra offers new work by Darrell Katz, Bob Pilkington, Bruno Raberg, Ken Schaphorst, and Nicolas Urie at Cambridge YMCA Theatre Nov. 7. Jon Garelick can be reached at jon.garelick4@gmail.com.